Bronxville NY, April 13, 2018 — The judges of the third annual Sarah Lawrence International Audio Fiction Awards (The Sarahs) have announced the finalists in this year’s competition for the best in audio fiction. The six pieces chosen represent a variety of audio fiction made this year, from science fiction to bi-lingual tele-novella inspired dramas. The winners will be announced at an awards ceremony on April 23, 2018, and streamed live from the Players Club Gothic Revival Style mansion at Gramercy Park in Manhattan. Appropriately held on Shakespeare’s birthday, the ceremony will be hosted by members of the Off-Broadway troupe Drunk Shakespeare, who will also perform. The brainchild of Sarah Lawrence College Writing faculty member Ann Heppermann, whose own stories have aired nationally and internationally on National Public Radio, the BBC, and on numerous shows, and co-founder Martin Johnson of Stockholm, The Sarahs are helping to establish the genre of audio fiction as a pillar of creative story making. More than 200 works from around the world were submitted in this year’s competition. Prizes will be awarded for First ($2,000), Second ($1,000), and Third ($500) places, as well as Honorable Mention ($250). Also announced will be the winner of the first-ever Brave + Bold Contest, a partnership between The Sarahs and Audible, the largest seller and producer of downloadable audiobooks and other spoken word entertainment. The winner will receive a $15,000 development deal with Audible Originals to create an audio fiction pilot. Almanak is a story about looking at the past and trying to see how to continue in the future. An old woman has to move from her apartment in a working-class neighborhood in Ghent. The only thing she can really take with her is her cat. Nico needs a break. He rents the apartment and is confronted with his own choices. Celestial Blood is a radionovela about love, mystery, and family secrets across borders. Released both in English and Spanish, it follows the story of twin sister and brother Sol and Mundo from Queens, New York. When they travel to Mexico to attend the funeral of their estranged father, they find out they have nine siblings they did not know about. All of them named after celestial bodies, like themselves. While at university Meggie lost her sight in an acid attack. Fifteen years later, she has finally learned to cope with her “dark gift.” Now an invitation to join her old college friends at a country cottage brings back shadows from her past. Jayne Lake is A Somethin’ Else production for BBC Radio 4. This radiophonic drama work addresses the invisibility of artists today. It also references last century’s Croatian writer Miroslav Krleža, who many times either overwhelmingly accepted or pushed away from publicity. Using the voices of three performers and the iPad effects looper produces experiments of voice, sound, and text on the subjects of invisibility, silence, or mishearing of the artist. After their suicides, Romeo & Juliet exchange frantic text messages when things go awry in the afterlife. Can the teens’ relationship survive an eternity? Starring Noël Wells and Paul Rust of Netflix’s Love, Romeo & Juliet is part of Pen Pals, a scripted comedy series that puts unlikely pairs in conversation. It is a part of Earwolf Presents and is a production of Stitcher. Voices of the Revolution is a science fiction podcast following Louis Themm, a 19-year-old who collects the stories of people swept up in a civil war, including soldiers, street kids, teachers, scientists, refugees, and war criminals. This year’s judges were: Berry Sykes of Podcasts in Color; Nicholas Quah of Hot Pod and Vulture; Julie Shapiro from RadioTopia; Andrea Silenzi of Stitcher and Panoply, and Carola Haupt of Radio Papesse in Florence, Italy. Sponsors of The Sarahs, who provide prize money and underwrite travel costs, include Sarah Lawrence College, Academic Federal Credit Union, KCRW, and Panoply. The Sarah Awards are sponsored by Sarah Lawrence College, a liberal arts college known for its strong focus on writing and for fostering creativity and experimentation. The College has cultivated the talents of visionaries like Yoko Ono, Meredith Monk, J.J. Abrams, Alice Walker, and many others. 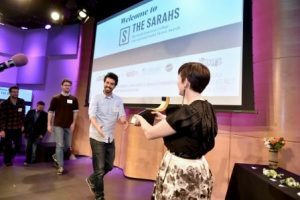 Sponsorship of The Sarah Awards recognizes the College’s commitment to furthering the intersection of the narrative, arts, and technology. Ann Heppermann, a member of the Sarah Lawrence writing faculty where she teaches audio fiction and narrative journalism, is a documentary artist, reporter, and producer whose stories air nationally and internationally on National Public Radio, the BBC, and on numerous shows. Her Peabody award winning work has aired on numerous public radio shows including This American Life, 99% Invisible, and Radiolab. In 2011 she was named a United States Artists Rockefeller Fellow. She hosts the fiction podcast Serendipity with Martin Johnson. Martin Johnson is the creative director at Ljudbang productions in Stockholm and a radio producer, journalist, sound designer, and author. In 2008, he won Prix Italia for his documentary “My Father Takes a Vacation.” His work has been broadcast around the world in England, Canada, USA, Germany, Hungary, Italy, Finland, Norway, and Ireland. His collection of essays called “The Ocean” was published in 2012 with much critical acclaim and is translated into several languages. He has written several radio drama plays. This entry was posted in Press Releases and tagged Sarah Awards 2018. Bookmark the permalink.